He finished Day 1a as an overwhelming chip leader. Day 2 went much the same and now he’s won the 2015 Unibet Open Glasgow Main Event. Ladies and gentlemen, Mr Daniel Chetrov. The final table was set early in the day when Herman Hjalm raised to 40,000 from the button, Annar Bjorsmo three-bet and then called when Hjalm pushed all-in for an additional 120,000 chips. Hjalm turned over and was in big trouble against the . His situation grew worse on the flop and when the turn and river fell and the final table was set. Five hands into final table proceedings, Heins Kalde opened to 45,000 with , Chutrov called with and James McAulay squeezed all-in to 186,000 with . Kalde called the shove and then called off his last 355,000 when Chutrov pushed all-in. A board reading and McAulay was gone. Next to fall was Ramunas Granskas. The Lithuanian committed his 141,000 stack with and Wenbin Chen called with on the button and when the five community cards fell Granskas bust in eighth place. Seventh place, and £7,100 in prize money, went to Nicklas Degn who moved all-in for 722,000 chips from under the gun and Chen reraised all-in for 928,000 to isolate him. It was for Degn but the powerhouse hand that is for Degn. Degn was drawing to two outs, but they failed to appear as the five community cards ran to send the Dane home. Ninib Messo then fell in fifth place and collected £8,550. Messo pushed all-in for 12 big blinds from under the gun with and it looked like he would collect the blinds and antes until Chutrov woke up with in the big blind. Chutrov went on to improve to a set on the flop, with the turn leaving Messo drawing dead. The completed the community cards and Messo, who qualified for only €10, headed into the Glasgow sun. 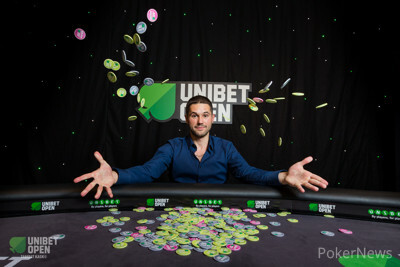 The man who qualified for this event at Unibet Poker for only €2 and who was playing in only his second live tournament, Kalde, was the fifth place fisher. Chen pushed all-in from the small blind with to put Kalde to the test for his 12-big-blind stack. Kalde called and showed , but was in bad shape against Wenbin's dominating hand. Neither player improved on the board and Kalde's superb run came to an abrupt end. Play went three-handed just before the dinner break when Arne Bjorsmo crashed out. Chutrov opened to 100,000 with Anders Ostrowski called with and Bjorsmo squeezed all-in for 610,000 with . Chutrov folded but Ostrowski called. Bjorsmo was drawing to a single out as Chutrov had folded a deuce, so when he failed to hit on the it was anything but surprising. Heads-up was set with the exit of Ostrowski. Ostrowski was left with a handful of big blinds when Chutrov raised to 120,000 with , Ostrowski called with , and Chen called. The flop fell and the action checked to Chutrov who bet 190,000. Only Ostrowski called. The turn gifted Chutrov quads fives and he bet them to the tune of 160,000 after Ostrowski checked to him. Facing the bet, Ostrowski raised to 450,000 and Chutrov called. The river improved Ostrowski to a flush and he moved all-in, only to be snap-called by Chutrov. Ostrowski tripled up a hand later when his beat and when the board ran , but then busted when his lost to Wenbin's on a board. A lengthy heads-up battle saw the chip lead exchange hands dozens of times, but the only time it really mattered was the final hand. Wenbin opened to 200,000 and called when Chutrov three-bet to 660,000. The flop came down , Chutrov fired a 450,000 bet only to see Wenbin move all-in for 2,035,000. Chutrov went into the tank then called to create a huge pot. The dealer burned and placed the on the turn to gift Chutrov the lead. 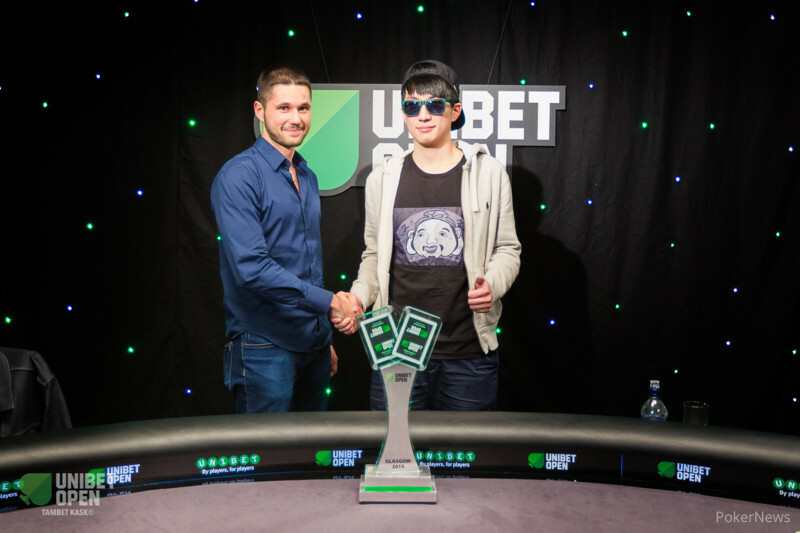 The river was the and with that Wenbin was eliminated and Chutrov became the 2015 Unibet Open Glasgow champion. Chen Wenbin opened to 200,000 with and called when Daniel Chutrov three-bet to 660,000 with . The flop came down , Chutrov fired a 450,000 bet only to see Wenbin move all-in for 2,035,000. The chip lead continues to change hands every few hands or so. 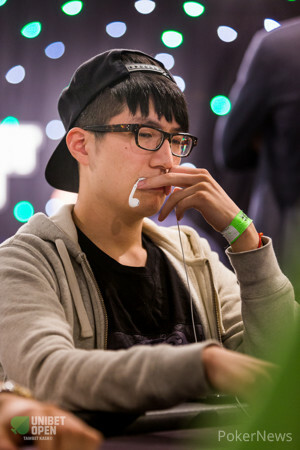 Chen Wenbin is still in the lead despite losing an all-in with versus when the board ran . Chen Wenbin raised the button with the lowly and Daniel Chutrov called with . Chutrov then check-called a 230,000 bet on the flop, then both players checked the turn. Chutrov checked top pair when the landed on the river, then called a 450,000 bet to win the pot with a pair of jacks. A short stacked Daniel Chutrov was all-in with versus the of Chen Wenbin. Chutrov came out on top when the five community cards ran , but Wenbin still has a decent lead. Chen Wenbin raised to 180,000 with and Daniel Chutrov three-bet to 450,000 with . Wenbin responded with an all-in four-bet of 3,200,000 and surprisingly Chutrov folded his big ace. There are now only 200,000 chips separating the two heads-up players, who is your money on?